Vancouver Canuck Mike Gillis says his team needs only minor improvements to contend for the Stanley Cup again. The hurt the Vancouver Canucks feel over falling one victory short of winning the Stanley Cup is eased a little by the knowledge the core of the team should remain for next season. The Canucks learned some important lessons during the long run to this year's final. Vancouver better understands the importance of having depth on the roster and the resiliency required to be an NHL champion. The biggest frustration was getting so close, but still coming away empty handed. "It really hurts when you get a chance and you're not taking it," captain Henrik Sedin said as the team gathered one last time Friday. "It's not easy to get that deep in the playoffs. "Even though we are going to have pretty much the same team next year, it wasn't easy this year and it won't be any easier next year. That's why it hurts when you get a chance and you don't take it." Vancouver was beaten 4-0 by the Boston Bruins Wednesday night in Game 7 of the Stanley Cup final. It was the first time in 17 years the Canucks had played for the Cup, and the third time they lost in the final. 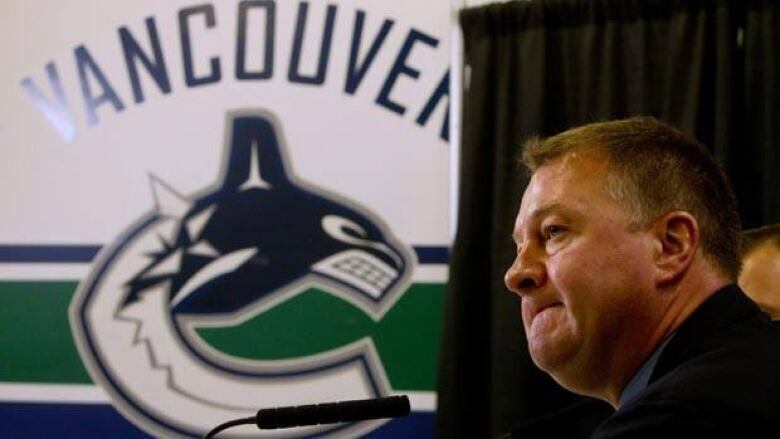 General manager Mike Gillis said injuries during the playoffs drained the Canucks' talent pool. He will look to improve the team's depth while making some upgrades. "In the final, it really wasn't reflective of the team we had during the season," Gillis said. "We are going to get those guys healthy. "Then we are going to start to move ahead. We are going to look at every possibility to improve in every area. I don't know what that will bring. We are going to try to do some things to make sure we continue to build depth that is playoff depth, retain our core players, and try and replicate exactly what we did this year and hopefully complete our goal." Vancouver had trouble dealing with the Bruins' physical style. Henrik and Daniel Sedin couldn't shake loose from the tight checking. The Canucks didn't shove back when the Bruins began pushing them around. The Canucks are a team built on speed and skill, a formula Gillis doesn't plan on abandoning. "That series [against Boston] may have reflected a different era in hockey," Gillis said. "But it is what it is. "We designed a team around the current rule book and the current method of playing. We were the best team in the league this year. I am not going to plan a team around competing with one specific team." The Sedins have been criticized for combining for just two goals and three assists in the final. Henrik understands the frustration. "We are going to have to prove people wrong again," he said. "We have done it throughout our career. "We have proven to everyone we can go deep in the playoffs. Now it's about winning." Goaltender Roberto Luongo is again facing questions about not being able to win the big games. "You try not to listen to it," said Luongo. "There is always going to be different opinions. Good ones, bad ones. "It comes with the territory. You have to learn to deal with those things and not let it affect your performance." The list of Canuck injuries is long. Defenceman Dan Hamhuis requires surgery to explore the extent of an abdominal injury. Mason Raymond could be gone to November with a severe back injury. Mikael Samuelsson had abdominal surgery earlier in the playoffs. Playing hurt was Christian Ehrhoff (shoulder); Chris Higgins (foot); Kevin Bieksa (bruised MCL); Ryan Kesler (hip); Alex Edler (two broken fingers) and Henrik Sedin (back). Gillis has some decisions to make, especially on defence. Both Bieksa, who earned $3.75 million US this season, and Christian Ehrhoff, who was paid $3.5 million, become free agents July 1. Bieksa sounded confident he can reach a deal, even if it means taking less money. "I'm not a money guy," he said. "I'm optimistic we are going to get something done." Gillis believes he can sign both players. "Right now I am very confident," he said. Other free agents include defencemen Sami Salo ($3.5 million) and Andrew Alberts ($1.5 million). The free-agent forwards are Chris Higgins ($1.6 million); Raffi Torres ($1 million); Tanner Glass ($625,000) and Jeff Tambellini ($500,000). The restricted free agents are Maxim Lapierre ($900,000); Jannik Hansen ($825,000); and Lee Sweatt ($650,000). The Canucks also must decide how long they want to keep backup goaltender Cory Schneider. Schneider had a 16-4-2 record, a 2.23 goals-against average, and .929 save percentage last season. He will earn $900,000 this season before becoming an unrestricted free agent. There's speculation the Canucks might trade him, but Gillis is in no hurry. "I would be more than happy to have Cory Schneider here for the next five or six years," Gillis said. "If something comes our way that is going to help us improve, of course we are going to look at it. If it doesn't, Cory Schneider will be on the team next year." The Canucks had the best regular season in franchise history. They won the Presidents' Trophy for the best record in the NHL. Vancouver set franchise records with 54 wins, 117 points and 27 road victories. The Canucks scored more goals than any team in the league and allowed the least. Daniel Sedin won the scoring title with 104 points and is a finalist for league MVP. Other finalists for league awards are Luongo (Vezina); Kesler (Selke); Alain Vigneault (coach of the year); and Gillis (executive). Bieksa said the Canucks are a very good team that need just a few more pieces. "We don't have all the pieces," he said. "We would have won if we did.